When choosing which computer, answer these questions: do you need to be able to do mobile recording? Do you want to use an Apple-based or PC-based DAW? Your answers will determine whether you check out laptops versus desktops, Macs or PCs. This will be an expensive piece, so choose wisely. Once you have a computer, you need to choose which Digital Audio Workstation (DAW) you want. This program collects all the audio recordings, hosts and translates the midi into instruments, and mixes the recording sessions. Pro Tools ($699) and Logic Pro X ($199) are two of the most popular, but there are many that are close behind, such as Cubase ($499), Studio One ($99-$399), and an excellent free program called Reaper. You’ll need an interface for the analog (microphone) to digital (1s and 0s) conversion. If you plan on recording drums or multiple instruments at once, look at interfaces with at least 8-channels. Presonus’ FireStudio Project ($399) is reliable and recommended. If you are doing a lot of programming and only recording one instrument at a time, you should look at 2-channel interfaces, which run about $100. There are a million microphones to choose from. For a good and flexible option, consider a large cap condenser. 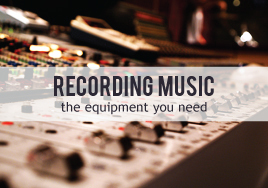 It can be used to record vocals, acoustic guitars, guitar cabs, and more. Two examples are Sterling ST-51 ($99) and Studio Projects C1 (used for $120). Finally, to listen back and mix what you’ve put together, you’ll need either headphones or mixing monitors. If you can’t get both, choose the headphones, as they can also be used to allow people to listen to click tracks or previously recorded tracks while recording. Starting a home recording studio can be expensive, or it can be as simple and inexpensive as the core pieces listed above. You can save further money by buying used instead of new. Either way, if you set up a quality studio and have the skills to back up the equipment, you could make your money back by offering your studio services to other musicians. Weighing the pros and cons of creating a home recording studio? Read more here. Have you already set up a home recording studio? What is your favorite essential equipment? See also: Performing vs Recording: A Musician’s Focus, Recording Music: Pros and Cons of Creating a Home Studio, Music Recording Equipment: The Best Microphones, Music Recording Equipment: Finding the Right Headphones, Music Recording Equipment: Digital Audio Workstations.